NORWALK — Lynn Hamlen and Kimberly Ryan Ekern sit on a sleek white linen couch, decorated with silver graphic pillows. A potted shrub rests on a silver platter on the coffee table in front of them, accompanied by tall black candles in clear candlesticks. The area is lit by bold brass lamps and on the table is a dish of potpourri which brings a distinct flowery smell. This isn’t someone’s home though. It’s Hamlen’s booth at the Fairfield County Antique and Design Center in Norwalk. Hidden on Willard Road off Route 1, it has rentable spaces for antique dealers to sell accessories, art and furniture that reflect their own unique style. “I want people to envision how this could fit into their life,” Hamlen added. Hamlen’s booth “Folly” got its start on the Post Road in Darien in 2013. Before then, Hamlen lived in town 42 years, chairing the school board for five years and running the Darien Nature Center for 20 years. But her artistic training came before from when she was a child. Growing up, Hamlen said her family moved a lot and she learned about design from watching her mom arrange the same furniture in new homes. In January 2017, Hamlen moved Folly to the antique center to allow herself more time and freedom. Booth owners there can drop in and out as they see fit, while center employees help customers with purchases the rest of the time. 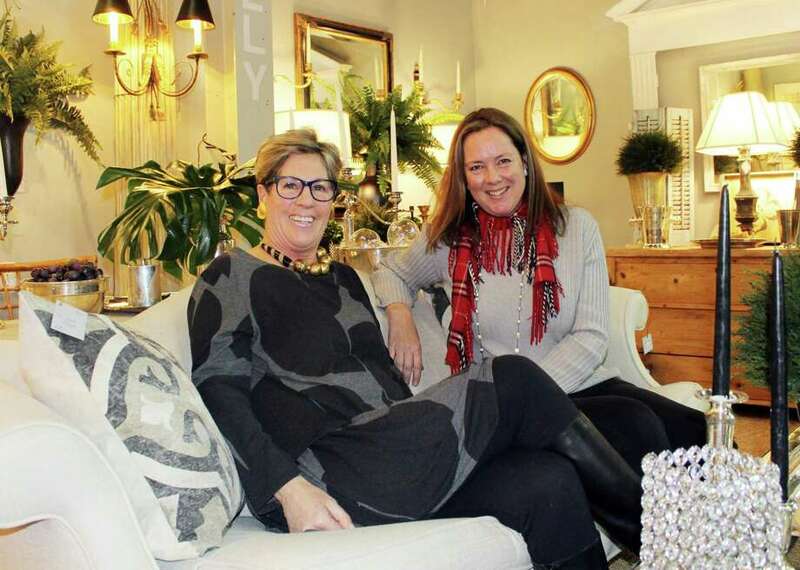 It was at the Fairfield County Antique and Design Center that Hamlen met Ekern, a Darien resident with a background working in fashion magazines such as Vogue. After years of curating photo shoots with delicate jewelry pieces, Ekern decided to open her own booth “Spot On” at the center two years ago. Ekern’s booth is filled with quirky finds like a pair of designer sunglasses and a metal giraffe sculpture that towers over six feet. Ekern said a lot of her items for sale come from her own collection from working in fashion, but she’s also a lifelong shopper of estate sales, going as far as the South to find rare items. While sites like eBay have made sales a bit harder, there are still goods to be found. This is evident in the front of Ekern’s booth where two white linen chairs sit. Ekern said they were originally covered in animal print fabric, but she loved them and saw potential. A new fabric made them the perfect fit for her store. Both women said pursuing items that catch your eye is one of the keys to successful antiquing and the only sure way to avoid buyer’s remorse. They also agree it’s important to buy what you love and not just what customers want. Ekern said her look veers more toward mid-century with a sense of “humor” as Hamlen describes it. Her fashion roots show in Spot On with Chanel handbags. Ekern said she also likes buying old artwork and researching its history, occasionally finding some hidden gems. Other times, items found at sales turn out to have a less than exciting history: Hamlen said she once bought what she thought was an umbrella holder that was actually a drain pipe covered in decoupage. Still, a customer bought it. “We both have unique visions,” Ekern said. “You have to see beyond,” Hamlen added.